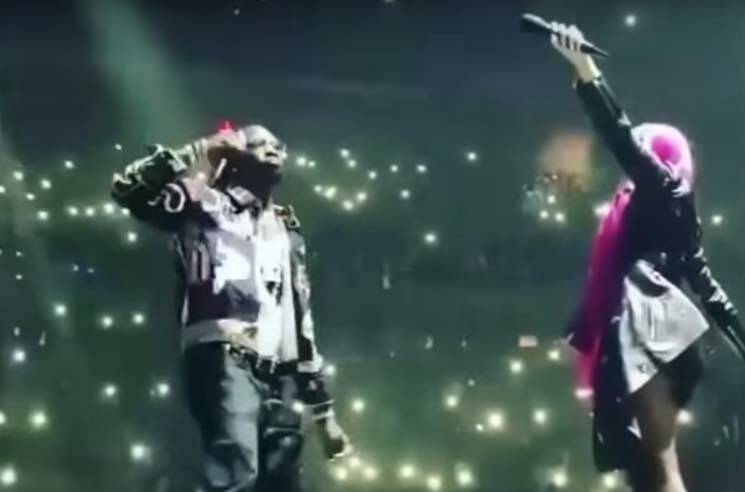 Despite some early setbacks, Drake and Migos finally seem to be sailing smoothly on their "Aubrey and the Three Migos Tour," and they're keeping fans on their toes with a slew of surprise guests — and the latest celeb to crash their stage was none other than Cardi B. The New York native joined her husband (Offset from Migos) on stage last night (August 26) at Madison Square Garden, surprising the crowd to perform her verse on "Motorsport." It marked the rapper's first live performance since giving birth to daughter Kulture earlier this summer. Watch fan-shot footage of the cameo below. Previous guests brought out by Drake and Migos include back-to-back appearances by Travis Scott in Toronto and an appearance by Tory Lanez in New York on Friday (August 24). Drake's album Scorpion is available on CD through Umusic. Migos' album Culture II is available on red 3LP or MP3 download. ​Migos Unveil Mountain Dew Jingle "Position to Win"
Mustard and Migos Link Up on "Pure Water"